an investment property in Kitasenju (Adachi-ku) « Are you looking for real-estate for sale in Japan? All of the current tenants are business. Kitasenju is conveniently connected with central parts of Tokyo with Tokyo Metro Hibiya Line. Because Kitasenju is in a convenient location while being in-between Akasaka and Kashiwa (Chiba), the town is growing remarkably. 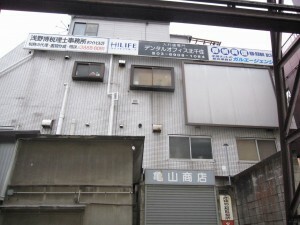 There is a nice shopping zone by Kitasenju station where there are nice restaurants. Please let us know, if you are interested in the property. You may not know about the town so much. But it is a surety that Kitasenju is bustling with more people and businesses.